This field of winter cress came into bloom about two weeks before we started to harvest. It's several acres big and alive with bees. The day we took honey the bees were so concerned with flying here that they barely bothered us. A situation like this is called a honey run. 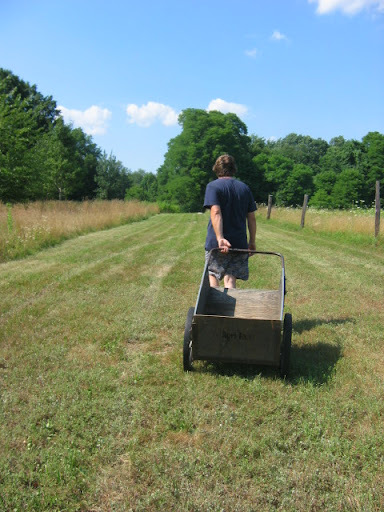 July 2011 honey will contain winter cress, sumac, dandelion, fruit tree, catapula, basswood, and garden flowers. 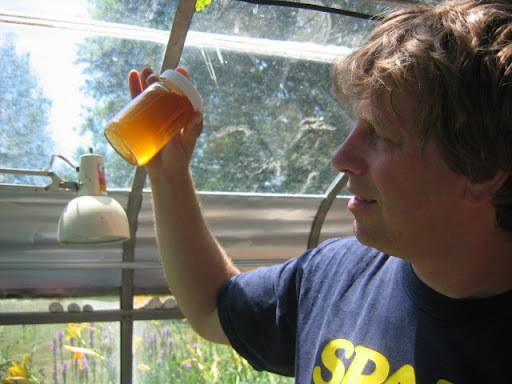 Since both bee yards have good access to Smith College there'll also be some gingko honey in there! 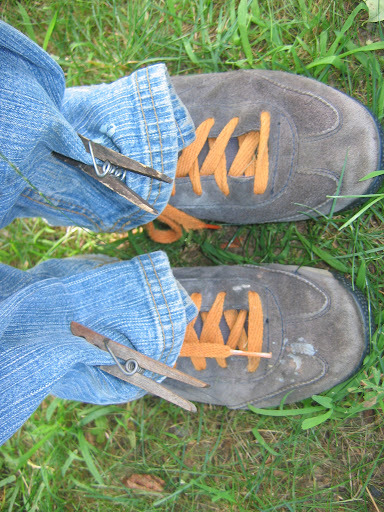 Priscilla gears up by clothes-pinning her pants shut. Beekeepers know something running down your legs is sweat, something running up is trouble. Priscilla takes the first super of honey from me. A super is the box the bees put the honey in. 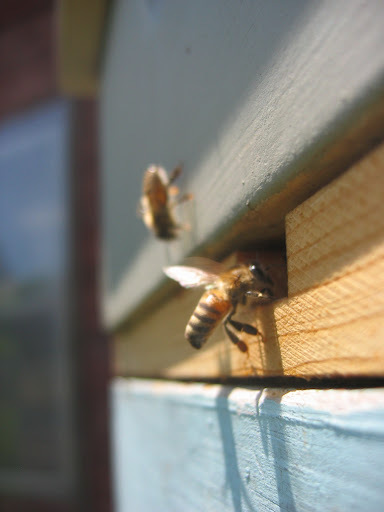 A hive body is the box bees raise brood in. This box weighs about 40+ pounds. Note the lack of veils and gloves. The bees were really mellow throughout. We did put them on later but after disturbing all the hives in the yard the bees are bound to get a little testy. Priscilla holds up a perfect frame of honey. This frame is so perfect we should have saved it for a county fair entry. That is what success looks like. A frame like this will only be drawn by a strong hive with good nectar foraging options. Priscilla, Erin and I inspect a hive for removable frames with well-capped honey. Erin is our bee "intern". The relationship is pretty informal but Erin helps out around the bee yard learning about how to keep bees. She's a sustainable agriculture grad student at UMass and a Smith grad. She helped set up Smith College's community garden program. We're confident Erin will put her education to good use. She's super smart and fun to be around. We use an herbal substance called Bee Quick to clear supers of bees. It was made by a company called Fisher's, and contains a blend of herbs that bees don't like to smell, so most move out of the super. It's sprayed on a board that is positioned above the hive and the bees just move down into the lower parts of the hive. A few stragglers are always left. Priscilla uses a leaf blower I had laying around to clear the rest of the bees off. It works amazingly well. The bees just get blown out of the top and don't even seem mad - maybe a bit confused. They just sail back to their hive. This is common practice but we had never used it before. I feel that it's less disruptive to the hive and way fewer bees are harmed than the older process where bees are brushed off each frame. This little mini hive is called a nuc, short for nucleus Colony. It contains a queen and some workers and a little bit of brood. We use them as a back-up in case a hive goes queenless. The laying queen with consort is accepted quickly by the hives and things go back to normal quick. While we were working in the yard we looked into all the hives to see that things were going well. The queen in this hive is from a USDA breeding program that uses stock from the Siberian region of Russia. During the hot day we took several swims in the Mill River to cool off. 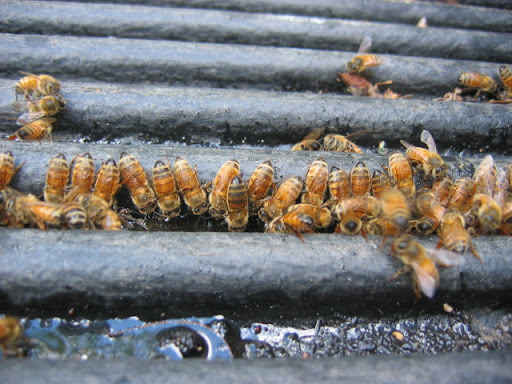 Priscilla is seen here after harvest and before extracting, the process by which honey is removed from the comb. She's standing in front of the greenhouse we use as a honey house. The very warm temperatures in there help the honey flow out of combs and eventually into bottles with a minimum of trouble. I love the fact that it's surrounded by bee-friendly flowers. Here is the final haul of supers stacked in the honey house. We left plenty of honey on the hives for the bees to use and they are still flying strongly to plants in the field. It's best practice to always leave enough honey for a hive to winter over successfully. We started to process the honey after dark, so the bees would stay back in their hive. We tried to process during the day once before and it was like the house was under attack by bees. I guess that's because it was under attack by bees. Priscilla cuts the caps off the honey so we can put it in the extractor to be spun out. She has a great touch with this. When done just right the cappings come off in roll like this. She uses a heated electric knife to do this. It's just warm to the touch, not hot. ...finally pours out the bottom through a course strainer, and passes into the stainless steel bottling tank. All our equipment is stainless including the strainer. The strainer is course and frequently overflows so a lot of wax, pollen and propolis wind up in the honey. These are all safe and natural hive products. Pollen in honey is reputed to help with allergies and loaded with protein and amino acids. Propolis has a lot of medicinal properties including being an antibiotic capable of killing MRSA, the super bacteria found in hospitals. Our honey practically defines raw unfiltered. We worked until 2 AM processing, as we didn't want to leave a lot of honey in the house to attract bees. We finally gave up and went home to bed. We returned the next day to to bottle our liquid sunshine. We placed the used equipment in the back of this field for the bees to clean off. They harvest a surprising amount of honey from the equipment. The bees then cleaned out any honey spilled in the bed of our pickup. And finally everyone went home and back to their regular jobs. Wow.. a beautiful blog!! Love all your photos! A great year for you guys this year!! Congratulations!.. Your honey will be found in my family's cupboards-- from DC to Connecticut to Hadley!! It's really amazing! what a great blog I love it. your honey is awesome all my family members are liked your honey. thanks a lot for making it for all of us. Let me tell you one thing The lettinglinks.com providing the best services to all. It may helps to find any property to lease or to sell or to buy or to rent in Northampton. you just login here . This is pleasure to read! I need to find more reasons to use honey in my food. Certainly you have many ways to incorporate it! A post? I read a article about homemade honey extractors at thez9.